cottages on-site are unused by pets. 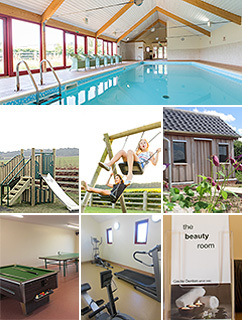 Indoor heated swimming pool, games room, well-equipped play area, mini gym, beauty room, and gardens (like a mini Centre Parcs, but with the seaside right next door – a homely alternative). many places to visit, and activities to enjoy, in this part of north Norfolk. Home Farm Holiday Cottages, Home Farm, Holt Road, Weybourne, Norfolk NR25 7ST Find us… and get directions. Note! Offers & late deals. Short / winter breaks. 1,2,3 are next-door cottages off-site. Last Easter Breaks from Saturday 20th April 2 or 3 nights. Rosedale Barn sleeps 4 and allows a dog Was £500, now £400. Barnett's Cottage - sleeps up to 7, in three bedrooms. Was £600. Now £500. Home Farm End - sleeps 4, Was £400. Now £320. These are prices are for two or three nights. You are welcome to stay all day Monday as the cleaners will come after the bank holiday. Loved the place. Loved the people. Love to come back every year. Review by Parent Friendly Stays (of us, Home Farm Holiday Cottages).